An Israeli soldier was killed during “special forces’ operational activity in Gaza” and multiple projectiles were launched at Israel from Gaza on Sunday according to the IDF Twitter page, the same day Hamas was threatened by a powerful member of their own people. Palestinian President Mahmoud Abbas on Sunday leveled perhaps his harshest critique of the Hamas terrorist group that runs the Gaza Strip on Sunday when he accused them of a conspiracy to “foil” an independent Palestinian state. 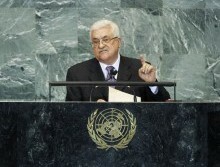 Abbas’ comments, which were published in a report by the Ma’an News Agency, further included a warning that the Palestinian government in Judea and Samaria (the West Bank) that he heads would be taking “tough measures against Hamas” in the days ahead. That same day, the IDF Spokesperson reported on Twitter that one IDF soldier was killed and another wounded in an “exchange of fire” during the aforementioned special forces activity. Following that post, numerous rocket siren warnings were posted by the IDF Spokesperson, with one Tweet noting that two projectiles from Gaza had been intercepted by the Iron Dome. The situation was serious enough that Israeli Prime Minister Benjamin Netanyahu shortened his visit to return to Israel from Paris, where he was meeting with world leaders and marking the 100th anniversary of the end of World War I, according to a press release from Netanyahu’s office. The day’s violence came as Abbas claimed that Hamas’ plan to prevent the creation of a Palestinian state would not succeed, and neither would the American-led peace process and it’s anticipated “Deal of the Century” for peace. Abbas isn’t alone in his recent critiques of Hamas, and ironically it’s one of main proponents of the American peace plan that also slammed the Gaza rulers last week. Jason Greenblatt, United States Special Representative for International Negotiations, took to Twitter last week to bemoan Hamas’ affinity with Iran. “Unsurprisingly, Hamas announced its solidarity with the Iranian regime, criticizing reinstatement of US sanctions, claiming the sanctions destabilize the region. Hamas should instead focus on the Palestinians of Gaza who suffer because of Hamas’ failures & malign activities,” tweeted Greenblatt. Things weren’t calm the weekend after Greenblatt’s comments. So while Abbas and the Palestinian leadership he heads are ramping up their animosity with Hamas, they aren’t the only ones finding fault and hostility towards the terrorists who rule Gaza. While there may be efforts to establish a ceasefire between Israel and Hamas, the list of Hamas’ enemies remains a lengthy one.